Each year for Christmas my sister would bring cookies with a Hershey kiss center to our family gathering . We all loved them. 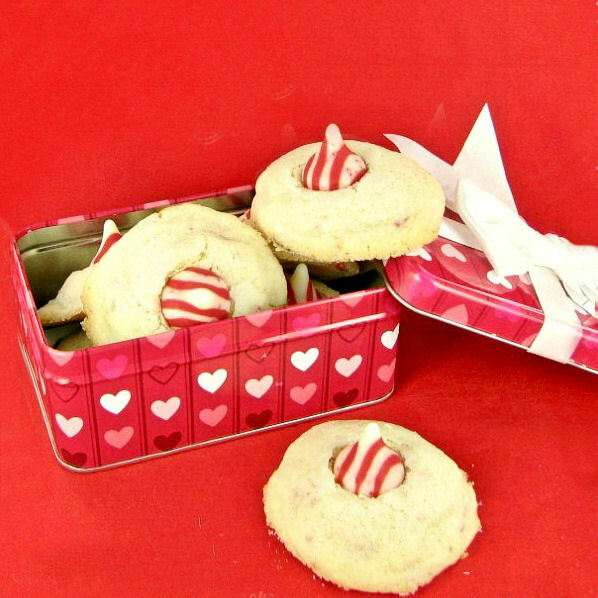 These Candy Cane Kiss Cookies are a version of her original but instead of using chocolate kisses, I use the candy cane striped ones. They are very festive and perfect for either Christmas or Valentine’s day. Check out my strawberry buttercream cupcakes for another tasty Valentine’s day sweet treat. For another wonderful version of this recipe, check out my Holiday Kiss Cookies. 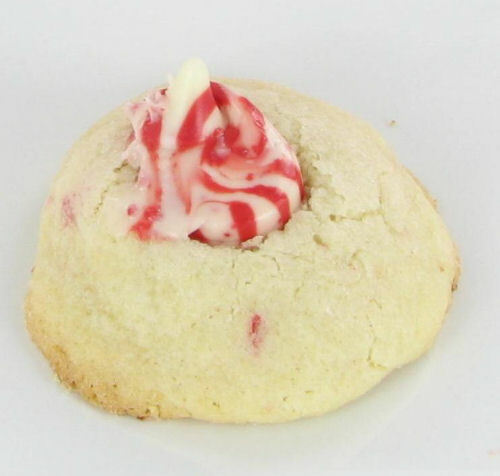 It’s time for some love with candy cane kiss cookies! If you love making 30 minute meals and quick desserts, you’ll love these cookies. They were a huge hit at my Christmas party this year. The recipe is easy. The main thing to remember to get perfectly shaped cookies is to make some room in your freezer before you start, so that you can put the cookie sheet in as soon as you add the kiss to make sure it does not melt. I do love my new Kitchen Aid stand mixer. It makes the preparation of baking goods a snap. The dough came out perfectly and was so easy to handle. My mum had one just the same and I grew up watching her bake bread and cookies with it. She died a few years ago, but using this mixer always reminds me of her. Just looking at these kisses makes me believe they will make a great cookie. They are so festive looking. Quite sweet for snacking but the flavor is great in a cookie. The chocolate cookieis a shout out to my sister Linda who inspired this recipe with her version! Don’t forget to roll the dough in granulated sugar. It makes them a bit bit crispy. 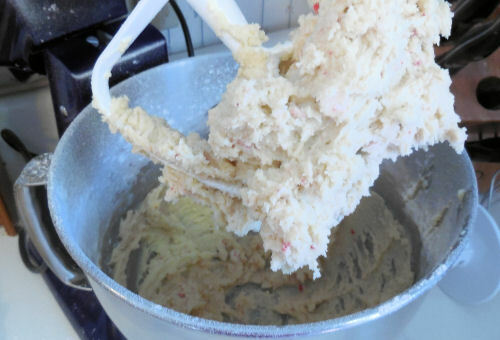 These yummy candy cane kiss cookies have a crispy texture. The surprise is the creamy taste of the chopped up candy kisses and the sweet finish of the whole candy kiss on the top. Place the cookies in a festive red box and they make a nice home made Christmas gift, too. Oh…and this is what happens if you don’t put them in the freezer to set. Those candy cane kisses do NOT like the heat. So don’t skip this step of putting them in the freezer when you add the kiss to the cookie! These cookies are a once in a while treat. Each cookie has 171 calories and works out to 8 Weight Watchers Smart points. Preheat the oven to 350° F. Make some space in your freezer that will fit the cookie sheet. 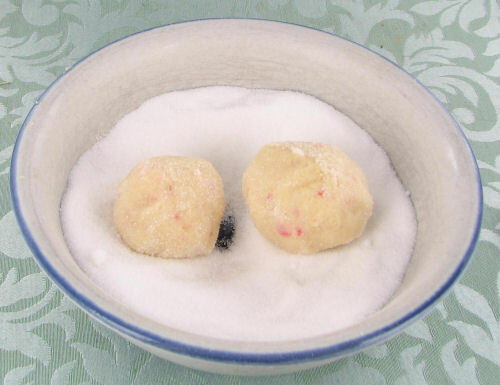 In large mixing bowl, combine the confectioner's sugar, butter, peppermint and vanilla extract, and egg. Beat at medium speed, scraping bowl often until the mixture is creamy (about 2-3 minutes). In a separate bowl, whisk together the flour, baking powder and salt. Gradually add the dry mixture to your mixing bowl until well blended (1-2 minutes). The mixture will be dry and crumbly. 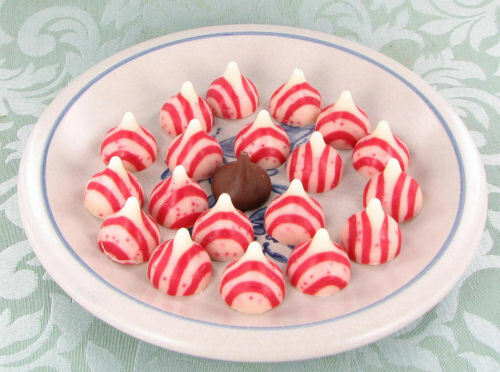 Stir in the chopped candy cane kisses. Shape the dough into 1 inch balls; roll in granulated sugar. Place 1-inch apart on a cookie sheet. Bake for 10-12 minutes or until set. Immediately after they come out of the oven, press a Candy Cane Kiss in the center of each cookie. Store in an airtight container in the fridge for about a week. The cookies also freeze well.